It’s cold. Painfully cold. So cold, I begin to question the logic behind my thrill seeking madness. It’s these sort of crazy people that end up on the news, right? The headlines screaming American Found Frozen Between Tectonic Plates, Iceland. The water is only up to my ankles, and already, a string of eclectic language has escaped my lips. It’s now or never, though. 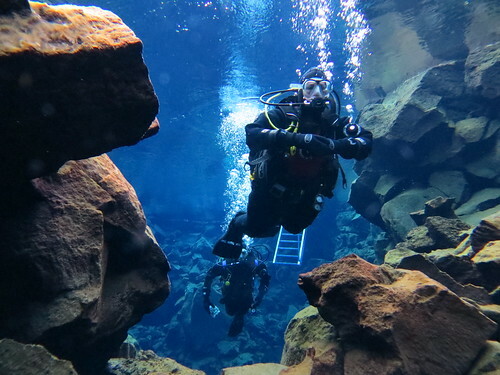 The frozen body of a Hawaii teen was located in the chilly waters of Iceland… I double-check that my mask is on tight, dry suit valves are locked and closed. ‘Oh god,’ I mumble as I plunge into the unknown. Splash. It’s silent. So silent, it’s almost eerie. I’ve only been in the water a few seconds, and already, my cheeks start to burn. The silence is pierced with me breathing quickly and heavily into the snorkel. I’m crazy. I’m crazy. I’m crazy. Only seconds have passed—I had never been this cold in my life. Bubbles fill my vision, all rushing towards the late afternoon surface. There’s another splash somewhere in the distance. The bubbles finally clear, giving way to one of the most extraordinary views I’ve seen. It’s beautiful. Pristine. Untouched. Wild. Rocks cascade hundreds of feet into a cerulean abyss. 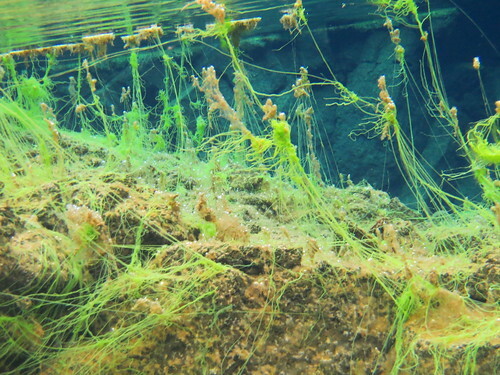 Long, neon green ‘troll hair’ clings to the rocks, swaying in a subtle and mysterious underwater breeze, only adding to the dream-like trance I’m caught in. I’ve slowed my breathing down once again. All that’s left to do is stare in awe at the awesome work of Mother Nature. Many times have I heard the expression crystal clear in describing a body of water. Living in Hawaii, I thought I had the definition completely locked down. Until that moment, I hadn’t truly appreciated or understood such a saying. If it hadn’t been for the 35 degree water that brought me back to my senses, I wouldn’t have believed over 200 feet of water kept me from plummeting to the ground. In this moment, looking over the towering rock formations and troll hair, it felt as though I was flying. The clarity was absolutely phenomenal; sunlight piercing through the glacial water, helping boost the array of blues and greens. Snorkeling there in no man’s land, it strikes me. The power of nature is not one to be messed with. Nina, our pixie look-a-like guide, motions the group to look up from the insane beauty. She points. In her little Icelandic accent, she says “North America.” She points the other way. “Europe.” I look back down at the rocks. I’m snorkeling. In Iceland. Under the midnight sun. In freezing cold glacier water. My friends are back home doing busy work, and I’m literally wedged between America and Europe. It’s been worth the all day wait. My mind begins to wander as I trace the steps back to how I ended up here. When traveling with my family, we like to get out there, and try the insane. In Sydney it was scaling the Harbor Bridge. In New Zealand, glacier hiking. Costa Rica, ziplining over waterfalls. 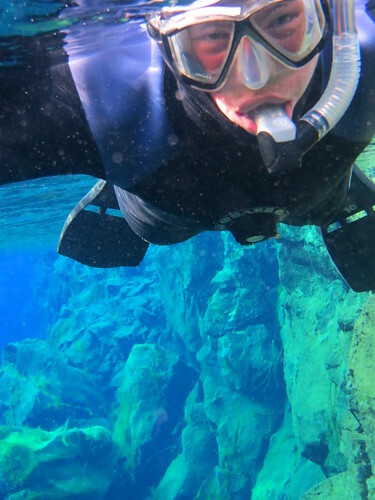 Upon discovering this particular snorkel on the pages of a pamphlet in downtown Reykjavik, I knew I had to take part, even if my family thought me crazy. Getting to the snorkel site was half the fun. Iceland has got tourism down to a science, accomplishing it with the many different and diverse tours. They’ve got a bus system mastered. As independent travelers, my family and I tend to keep our distances from large bus tours. In Iceland though, it makes transportation incredibly easy and cost effective. What’s great about the tours is you can pair them with another—in our case, we had booked an all day Golden Circle tour. Hopping aboard the bus, our spunky guide lathered the tour with history and fun facts. The Golden Circle is a 300-kilometer loop from Reykjavik to central Iceland and back. Along the way our three primary stops: Beautiful Thingvellir National Park, Iceland’s first national park and home to their first Parliament; the roaring Gullfoss Falls, which translate to Golden Falls; and the geysers Geysir and Strokkur. The scenery was extraordinary, the type in which you can hold your camera outside the window and just snap. 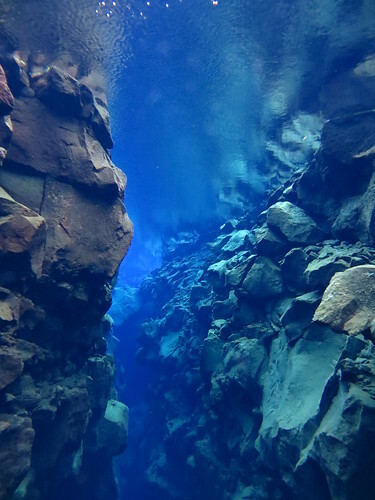 Because of the pairing of tours, we’d leave the Golden Circle tour a tad early; they’d drop us off at the Tourist Information in Thingvellir on their way back to town. Both the bus driver and the organizers in Reykjavik promised us someone from the snorkel company would come and take us to the site. The wait at the tiny TI seemed to go on forever. It was like the start of some cheesy horror flick. Our cell phones couldn’t pick up a signal, the payphone was out of order, we were stranded in the middle of nowhere miles from anything, and the woman working the tour desk wasn’t much help. All we had left to do was twiddle our thumbs and hope to god the ax murderers only hunted on weekends. A little van labeled DIVE.IS finally rolled into the parking lot, relieving us of the fear of being killed by a psycho. 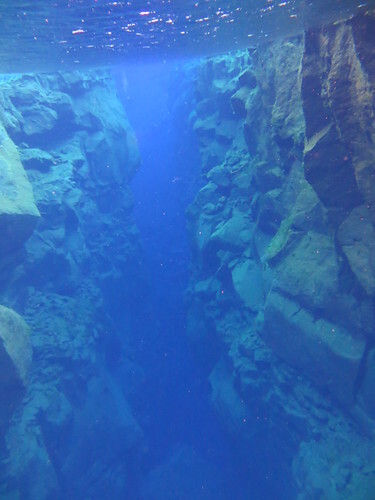 After signing many waivers, we hopped in the bus and started off towards Silfra, the rift between the two tectonic plates. 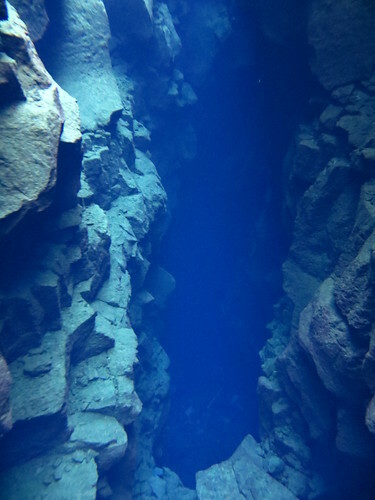 Silfra is where the Eurasian and American tectonic plates meet and drift apart, moving approximately 2 centimeters a year. The water temperature always lingers around a very chilly 35 degrees Fahrenheit. To prepare the body for such a shock, the nine snorkelers and divers in our group had to suit up into dry suits. Putting one on felt as though you were gearing up for a moon expedition. It’s skin tight, and took much shimmying and shaking to pull all the way up. The suit covers you just about from head to toe, only leaving your hands and a small bit of your face exposed. 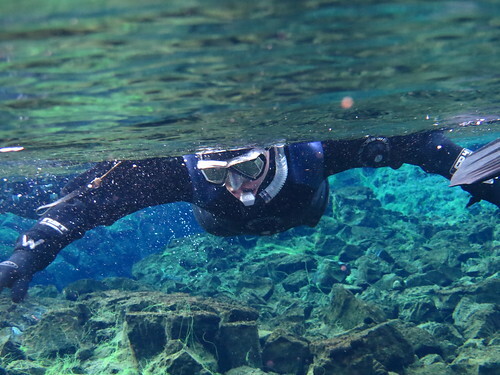 The neoprene suit is designed to keep water from entering, keeping the snorkeler or diver warm and dry. There were gloves too, though they don’t repel water the way the dry suit does. There’s an extensive safety briefing. As cool as this adventure may seem, a number a things could go wrong in seconds. Our pixie guide Nina, with her spiked blonde hair and spunky attitude, explained in great detail what could go wrong, and spiced the talk with many jokes. Already, it was hard to take her seriously with the Nordic accent and jokes. Once the briefing was completed, Nina (and the dive master whose name I forgot the moment he told me) dashed off to finish last minute details before we began our expedition of a lifetime. I stood on the edge of the rocky terrain, looking over the dramatic landscape and the cerulean rift separating me from America. Even standing above the chilly water, I could see forever down to the Earth below. 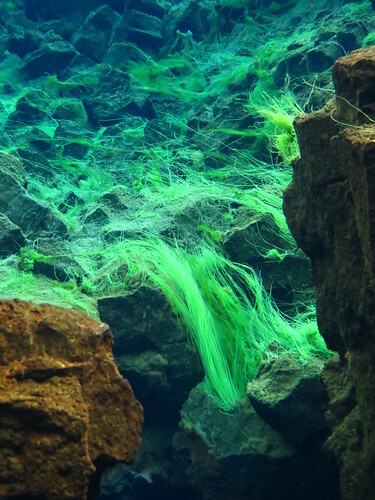 The long green troll hair waved mysteriously, clinging to the volcanic rocks that formed this rugged landscape. Hordes of Sand Flies buzzed about, relentless in their attacks on interrupting the still and silence of this beautiful place. It was summer time in Iceland, meaning the sun never set. It was going on six, and there was no sign of the sun getting ready for sunset. If you didn’t know how special this place was, you’d think it as just another pretty place to snap a profile picture or two. The snorkelers clung to each other like a band of brothers. If something were to happen down there, we’d be the only ones for each other. There was the talkative Australian, the happy German couple, the Zen Brazilian man and his parents, and then me. If ever a picture were to be added under Oxford Dictionary’s entry of Motley, it would be of the seven of us. It was finally that time. 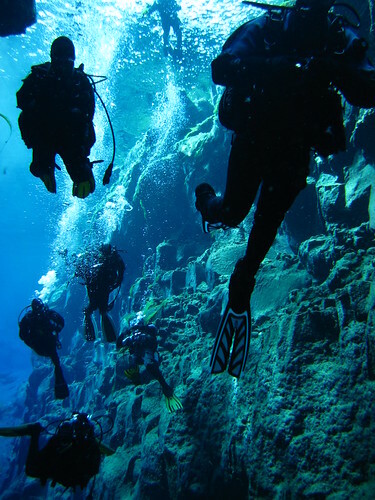 Dry suits on, fins, masks, and snorkels in tow, we wandered over to a metal platform. Stairs led down into the alluring yet intimidating abyss. The divers went down first. Screams and provocative language flew from their lips. 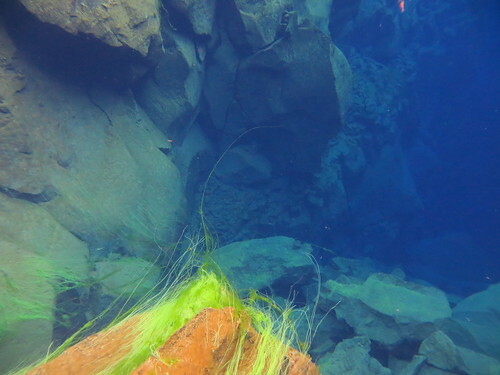 In an episode of bubbles, yelps, and giggles, the divers disappeared below the surface. All was calm again. One by one, the snorkelers went down, each one with a loud reaction geared toward the water. I was the final one to go down. Clinging to the rail, I awkwardly climbed down. Doing anything on land in fins makes things instantly awkward. The water reached my foot. And then my ankle. This wasn’t too bad, I thought to myself. The dry suit really does work. Then it hits. It was cold. Painfully cold. So cold, I began to question the logic behind my thrill seeking madness. It was then or never, though. ‘Oh god,’ I mumbled as I plunged into the unknown. It is something truly wild. My eyes hungrily gobble the sight before me, taking as many mental pictures as humanly possible. The views are intoxicating. 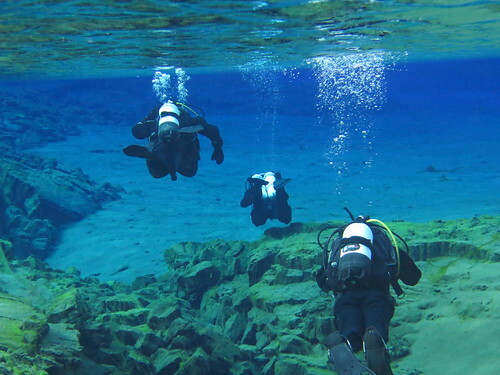 Dry suits are filled with air, which helps you float along the glassy surface. The less moving you do in this water, the warmer you stay. I try to still my hands, but it doesn’t seem to work. My cheeks burn. It doesn’t seem as though the cold should burn as though it’s hot. We slowly meander down the rift, exploring the nooks and crannies that are this natural gallery. Hardly any life can live in the freezing water. Nina did mention one breed of fish though. It’s only a few inches long and looks like a rock; alas, we saw no fish. 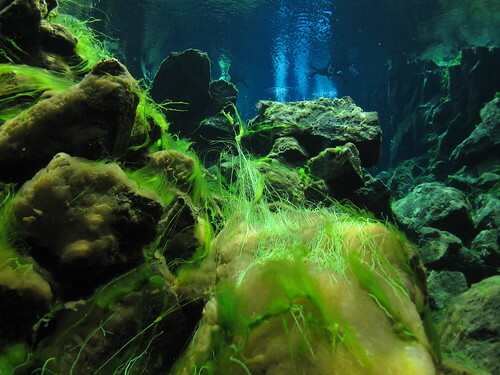 Silfra consists of three parts: the Silfra Hall, the Silfra Cathedral, and finally the Lagoon. With each section comes more wonders and mysteries than the one before. The water is insanely clear; I have to pinch my arm more than once to remind myself this isn’t a dream. It’s hard, though. I can feel my fingers getting more and more numb. Remembering Nina’s recommendation about the water, I spit out my snorkel and take a huge swig of the cold water. 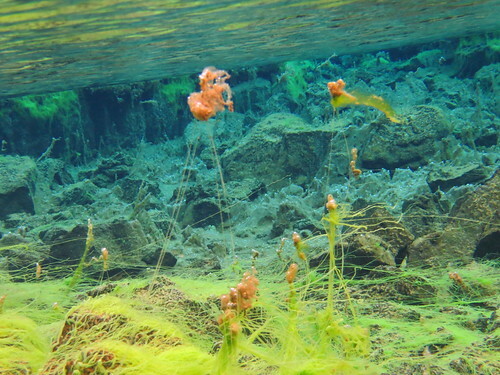 We are snorkeling in glacier melt off, meaning nothing could be fresher, or tastier. Who knew water could taste so wonderful? Even though everything was cold, the water traveling down felt good and refreshing. Rejuvenating even, in a strange way. The only sounds come from my snorkel, and the occasional splash of someone’s fins. I’ve slowed my breathing down as much as I can in an effort to stay warm, and to also further enjoy the serenity of this place. It’s such a beautiful moment. The rocks forming themselves into pillars and tunnels, the troll hair swaying. We press further into the strange world. It comes to a point where the water is barely a few feet deep. Nina warned us not to kick our fins in shallower areas, for it stirs up sand, mud, and rocks - and clouds the water. Sucking in my stomach as much as I can, I carefully pull myself forward, grasping the slick rocks to propel myself. It’s a meadow of troll hair, filling my mask with the sight of long, neon green strands. I pull myself out of the meadow, and gasp at the massive drop off, falling over 100 feet. The water is so clear, I forget that I’m floating, and prepare for a bone-shattering fall. Nothing. I laugh at myself. It then hits me; I can’t feel the sting of the water anymore. Again, I laugh. I’m crazy. I’m crazy. I’m crazy. Time seems to slow in this frozen world. It seems as though this is the place where fossils of some unknown species would be discovered. Nina stops, and points left. We’ve made it to the Lagoon, the last stretch of the adventure. As the water becomes more and more shallow, time begins to speed up once again. This trip is coming to a close. One by one, snorkelers and divers breach the surface. The midnight sun shines brightly down upon us. The water sparkles. I look at the time, wondering how long we were under. It seemed like hours. The watch tells a different story: only 40 minutes. Those 40 minutes were some of the most eerie, insane, and beautiful moments of my life. From where we popped out of the Lagoon back to the starting point is a little bit of a trek. The Sand Flies are still just as persistent, wanting to attack anything that moves. They give us the incentive to make the trek as quickly as possible. My hands have lost all feeling, and have even turned a light shade of blue. I spend the walk massaging the feeling back. My cheeks continue to burn, and my lips are lined with blue. It wasn’t until we returned to Reykjavik that feeling, and color, returned to my face. Walking back under the midnight sun, massaging the feeling back into my hands, half jogging across the moonlike landscape to escape the jaws of the relentless Sand Flies, and looking over the rift, I realized just how crazy I really am. I think back on the adventure - how insane it was, how extraordinary it was. How it wasn’t for everyone. Three of the nine in our group had problems. 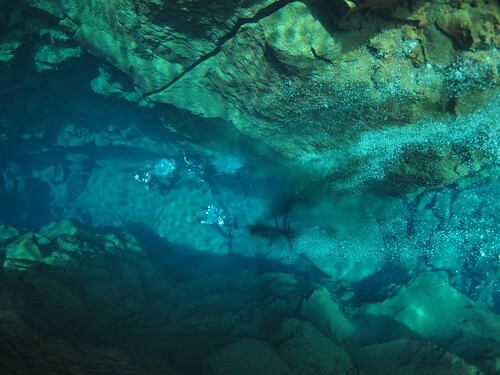 The Brazilian parents backed out last minute due to the freezing water and tightness of the suits, and one of the divers came up completely disorientated and confused, screaming she was a danger to herself and others. As my mother loves to say, there is a fine line between adventure and stupid, and that afternoon, I was threading that needle. Even though this is one of the most extraordinary dives/and or snorkels in the world, you have to be wary of your surroundings, and respect the power of Mother Nature. I look back on the experience today, and still believe that I was completely insane in wanting to do such a thing—though it remains the coolest thing I’ve ever done in my life. It truly was life changing, and something I’d recommend to anyone looking for adventure in Iceland. 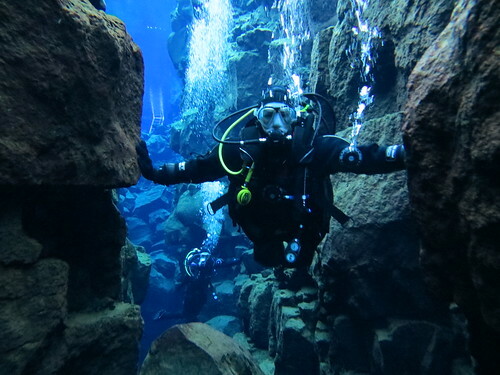 A tip from me, if you plan to snorkel or dive Silfra, bring a sweater for when you get out of the water. It may be a little chilly. And bug repellent. 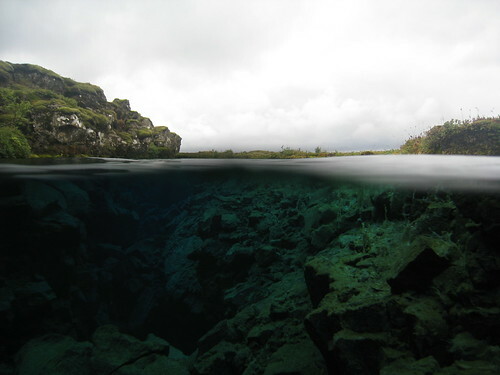 To learn more about Silfra, and other dive/snorkels spots in Iceland, check out this link http://www.dive.is/Diving_Iceland.php?page=Silfra, and to learn more about pairing this adventure with another, and other tours, click this link: http://www.adventures.is/Iceland/Snorkeling.